Weddings & Men....Weddings & Women....Totally different ideas and outlooks from those two groups! I have been thinking on this topic for some time now because it is hard to miss the differences in how men & women look at weddings. This became obvious early on when much of our early family life was centered around sports. Even now, there is always a discussion about some current sporting event, most recently the World Cup. I am still teased by my family regarding the memorable question: " Who pitches for the Dallas Cowboys?" After they quit laughing over that question and wiped their tears, my husband gently told me it wasn't a pitcher but a quarterback. I also tend to ask what inning, or half, or period it is and usually say the wrong term for the sport we are watching. I am immediately corrected with the correct term, usually in unison. I have learned alot about male sports over the years, and I do enjoy watching some of the many games that are on our TV. I always enjoyed watching the boys play any of their sports when they were little, even though I was not the best spectator when they played. I have come to understand how important, their "sport stuff" is to them. The same can NOT be said about how they view weddings. Let's face it, women dream about weddings most of their lives and men spend a good bit of their time trying to avoid them. I got married very young and had never been to any other wedding, but my own, when I got married. It was a nice small wedding with a very small reception in the church hall. I was just too young and dumb to realize there were lots of options for weddings and receptions. Since we had the reception in the church, this made it impossible to drink or dance....what were we thinking???? Even though it was simple and small, I loved my wedding and honeymoon and I certainly wouldn't change the groom! There is one thing that all brides have in common, no matter how much planning, expense, or money goes into the weddings. That would be their wonderful happy faces! Recently, we have attended a few weddings of friends' children and weddings of the boys' friends. 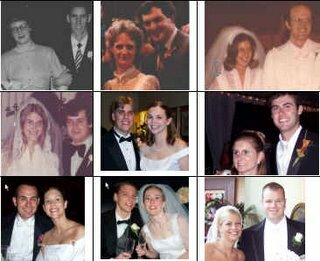 It seems like the boys have attended MANY weddings in the last couple of years. Wedding Season has provided me the opportunity to ask many questions about the weddings and/or engagement parties being attended. Becky and I have spent enumerable hours discussing wedding colors, dresses, ideas, settings, flowers and all the lovely things involved in the weddings. She never gets upset if I ask questions about the weddings she and Tommy attend, and she always has the answer to my questions. Even if the question is as ridiculous as : what type of shoes did the wedding party wear? She is after all a girl!! And girls get into weddings and all the tiny details....that's part of the wedding experience. I'm betting that most guys would never think about the programs and who actually tied that nice ribbon on them and how long that took to do that little job! Talking to any of the "GUYS" (husband included in this) usually results in much frustration. They just don't get the fascination about weddings! As I was told by one of my sons, who shall remain nameless, he said a good wedding had lots of alcohol. Mom: Did the bride look pretty? Son: Yeah she looked nice. M: What kind of dress did she wear? S: Just a wedding dress. M: What color were the bridesmaid dresses? Son, answer #1: Just a dress, I wasn't paying that much attention. Son, OR answer #2: Low cut dress in the back(or front), ______ looked good in it. One son was actually getting together with his out of town friends on the weekend that the "bridesmaids" where getting their dresses fitted. In his defense, he didn't actually go to the fittings, but he was with the whole group of girls/bridesmaids the whole weekend. He couldn't even begin to tell me a thing about the dresses! Not the color, not if they were liked by the girls...nothing. Now if that had been a daughter, I would have known, down to the last button, what the dresses were like! He has gotten a little better about sharing some details of the weddings he attends because he knows I will probably ask him something. He has even volunteered some information, if it was memorable to him. He mentioned one time that the location of one of his friends weddings was "pretty incredible and it was one of the best weddings he had been to." He even described some of the scenery and was really impressed with how beautiful the bride looked. That particular wedding was on top of a mountain at a winery. I guess there will always be that difference in how men & women look at the wedding thing. My boys will continue to get the "20 questions " about the weddings they attend because I really enjoy hearing about the details. They will continue to get annoyed at those questions, in most cases, just cause they are of the male gender. Becky and I will continue to discuss all the details. We probably will have these same communication issues when all those weddings result in babies! Mom: When is the baby due? M: Do they know if they are having a boy or girl? M: Do they have any names picked out? S: HOW DO I KNOW?? I so LOVE the pictures of all those weddings.... Aren't we all so HAPPY!! So true about the details....The Daughter can really get into details if she is in the mood....THe sons.......could care less.....and I love the "who is pitching"......sports girls we aren't......was that because Dad never watched sports or we just didn't watch them with him? OK wedding = A 20 minutes ceremony, I piece of paper reminding you that you are married, a little gold ring (that should be in your nose for guidance), and a lifetime of 20 questions. The answer to all those questions about weddings is PICTURES, PICTURES, PICTURES. Take pictures of the bride, groom, bride’s mom, groom’s mom (they never ask about what the dads where wearing, They were wearing the standard tuxedo, probably the same one they got married in). Take pictures of all the flowers, bride’s maids dresses (front and back), bride’s maids shoes, the floors, the doors, the limo’s, got the picture. OK the next section I had to delete. She did not like it So I will just say! And the pants in the family are once again worn by the female. Just in case you were wondering(I'm sure its a big surprise), I'm the nameless son. And I still don't care about what type of dress the bridesmaids are wearing. They either look really good in them or really bad. Both of those are acceptable answers in my opinion to the question, "What were the Bridesmaids wearing? ".